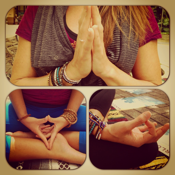 iYoga : Inspiring Health through Yoga Positions and Wallpapers ! Start The Year with a positive state of mind! Improve your Life Style and health with Inspiring Yoga positions! Encourage your self and others to find peace of mind with positive thoughts. *Whether you need to to send an inspiring message or encourage yourself by adding a position to your background you need this app. Add emotion and feeling to anyone'e day by personalizing any of the wallpapers from our gallery with a personalized message.